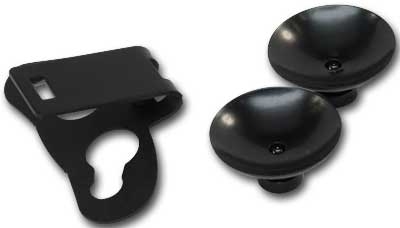 Uniden Two Suction Cup Radar Detector Mount for the Uniden R1, Uniden R3, Uniden DFR6, and Uniden DFR7 radar detectors. Uniden two suction cup mount for the Uniden R1, Uniden R3, Uniden DFR6, and Uniden DFR7 radar detectors. Moving your Uniden R1, R3, DFR6, or DFR7 radar detectors between vehicles? Uniden has you covered with their small two suction cup mounting bracket. The products were great. I cannot say enough great things to say about Mike. He was extremely helpful and a pleasure to do business with. Suction cups works excellent thank you very much. Thank you Mike you are excellent.